Screenwriter Drew Pearce is certainly enjoying success as Iron Man 3 becomes a billion dollar earner at the box office and now lands the opportunity to write the Mission Impossible film. 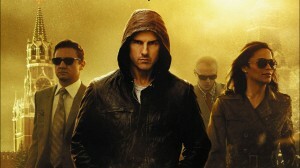 Paramount’s Ethan Hunt franchise has Tom Cruise and company returning for another adrenaline filled chapter after the last installment, Mission: Impossible — Ghost Protocol, which earned nearly $700M worldwide. Jack Reacher director Christopher McQuarrie will likely be taking over for the next sequel and fans seem receptive to Pearce after getting credit for contributing much of the action sequences in Iron Man 3. Pearce also receives a writing credit on Guillermo Del Toro’s massive Pacific Rim. The scribe is currently working on an original spec that will serve as his directorial debut. Mary Parent, who is a producer on Pac Rim, is attached to produce the project, which is not yet set up. The plan is for Mission: Impossible 5 to shoot this fall after Cruise finished shooting The Man from U.N.C.L.E. at Warner Bros.